Posted on 7/21/2015, 1:53 pm, by kittykill, under Tute Tuesday. Is it hot in here or just me? The sun is beating down and frying my little noggin’! I need something to protect me from the sunbeams, but still allow me to enjoy outdoors. Don’t forget, it must be fashionable! 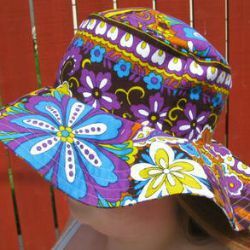 AlwaysInspired has created a tutorial for the Perfectly Vintage Sunhat that meets all my requirements. It keeps me cool and in style. It can be customized to fit any outfit I decide to wear. Check out our Clothing Board for great ideas to keep you shaded from the sun’s rays.